This is my new favorite and I made it up, so I can share. That new camera takes such pretty food pictures! This makes a big pot- I’d think you could feed 6 or 8 with it. Put everything but beans in big pot, bring to boil, then cover and simmer 40 min. (I like my beans really squishy, if you like yours more firm, wait until rice has cooked 50 minutes, add beans and cook 10 minutes more). Add black beans and stir to combine. Simmer 20 more minutes, until mixture is moist but not wet. Remove from heat. In small saucepan (I like to use a small saucepan because it Â½ sautees, Â½ simmers. ), heat oil and add onions, garlic, and salt. Cook over low heat until translucent, 10 minutes. Add chilies and chili powder. Cook over low heat until liquid is cooked mostly off, a few minutes more. Remove from heat. After these two pots are done cooking, stir onion mixture into beans and rice. 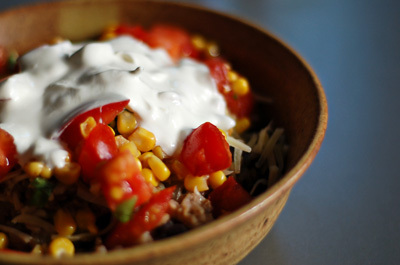 Serve topped with shredded cheese, corn and tomato salsa, and sour cream. Avocado would be good, too. This would rock as a burrito, too. Mix together and chill until ready serve or serve at once. sounds, and looks, delicious! perfect for summer lunch. I make something almost exactly like that (minus like 3 of the things you have listed) and here I was thinking I was so creative! Great minds think alike right?? Yum! I know you said feeds 6-8 but with a 21 year old boy (I guess he’s actually a man) in the house, it should be just enough for the three of us! you’ve made my mouth water! looks yummy! I’m doing this for dinner this week! Wow – that sounds delicious. A great summer meal. I’m definitely going to file that one away. Thanks! That looks delish! And you are killing me with all these gorgeous photos- I am desperate for a new fancy camera. We had this for dinner tonight, followed with lime real fruit ice pops. Delicious! I’m making this tonight–thanks for the recipe!! I made this for dinner tonight and it was delicious! Thanks for sharing your great recipe.